Young frequently designed and sent as many as 500 Christmas and New Year cards annually, and this one from 1938 features one of his many self-portraits and a reference to his several hell-themed books. As a working artist and small businessman he used his mailing list for contacts, especially when he was developing “Good Morning” magazine. This is a detail from the card. 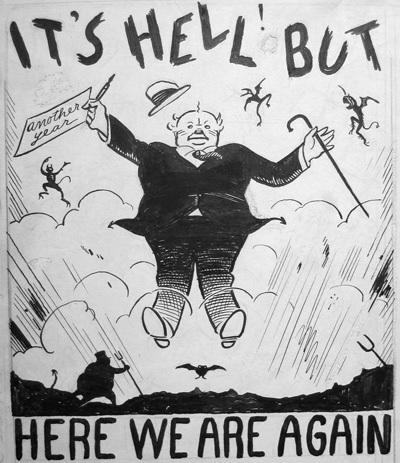 Young, Art, 1866-1943, “It’s Hell But Here We Are Again (detail),” Loyola University Chicago Digital Special Collections, accessed April 26, 2019, http://specialcollections.luc.edu/items/show/1702.